If you’ve ever visited a laundromat, you know there is a customary code of polite behavior that people abide by when washing and drying their clothes in a public place. Although this code is not set in stone, many customers follow it to protect their laundry and ensure they don’t upset the other patrons of the laundromat. As a laundromat owner, one way that you can help uphold the peace at your business is to establish a set of general guidelines regarding laundromat etiquette and hang them on a sign. That way, everyone knows how they’re expected to act in your laundromat. Check out our recommendations below. 1. Do not leave clothes sitting in a washer/dryer. It’s acceptable for patrons to leave their clothes in a washing machine or dryer when they leave the laundromat for a short while, perhaps to run an errand or fetch a cup of coffee. However, if you’re choosing to do this, you must time your outing carefully so that your clothes don’t hog the machine, leaving other people waiting. If you’re late, don’t get upset if someone moves your clothes out of the machine. Speaking of which . . .
2. If someone else’s clothes are sitting in a machine for more than five minutes, move them with care. First, don’t slam open a machine’s door as soon as the cycle finishes, ready to throw that person’s clothes on the floor. Cut them some slack! Wait about five minutes (or longer if you’re especially kind), and if they don’t show up, neatly place the clothes on a clean surface above or near the machine. If rolling carts are available, you could place the clothes in one. Do not place the clothes in a dryer. 3. Clean out the lint screen after using the dryer. If your laundromat’s dryers have lint screens, clean yours out when you’re finished with the machine. You don’t want to clean out someone else’s lint, do you? Return the favor by cleaning out your lint screen. 4. Don’t put too much detergent, bleach, or fabric softener in the machine. First, overfilling the washer with product can damage the machine or perhaps even create a safety hazard. Second, if you leave behind soap residue or bleach, you could affect the next person’s load of laundry. They might be allergic to your detergent or dislike the scent. Excess bleach could even damage their clothes. Use a small amount, as directed on the bottle. 5. Don’t try to reserve a machine. 7. Respect your fellow launderers. Everyone visits the laundromat for the same chore. Most people don’t enjoy doing laundry, but you can improve the experience for everyone by staying in a good mood and being polite. If you spot a first-timer who isn’t sure how to proceed, offer to help. In addition, don’t stare at anyone else as they do their laundry. (They probably don’t want you looking at their undergarments!). Also, don’t disrupt everyone’s quiet time by playing music, podcasts, or videos on your phone out loud. Avoid long phone calls as well. Finally, don’t hog the available seats with your laundry supplies or purse; keep these free so that others have a place to sit. 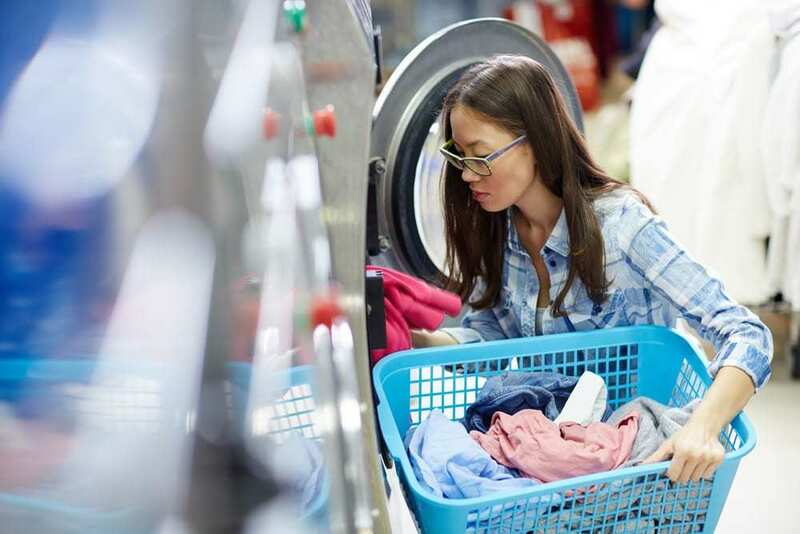 As a laundromat owner, you have the power to establish the rules of laundromat etiquette for your business. What do you think of our ideas? Do you have any other guidelines to add to the list?